A Sea Turtle Week was held in Semporna in conjunction with the World Sea Turtle Day on June 16. Many environmental awareness programmes were conducted during the week. 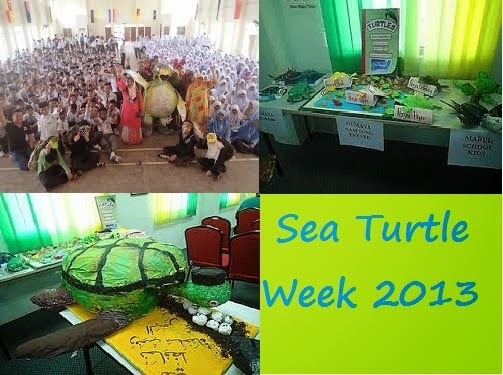 Five secondary schools took part in a competition to create turtle replicas from recycled materials. The colourful creative exhibits, equipped with key messages on turtles, were displayed and judged at the opening of the Turtle Exhibition, jointly organised by WWF-Malaysia, Sabah State Library and Semporna District Education Office, at the Semporna Library on June 19. SMK Datuk Panglima Abdullah has won the competition followed by SMK Tagasan and SMK Agama Tun Sakaran. A booth to sell handicrafts made from pandanus leaves has been set up by the Wanita Pulau Omadal, a local community group from Omadal Island. The profits that they made will be used to support conservation efforts in the Semporna Priority Conservation Area. Volunteer group, Green Semporna, was also present to recruit new members especially among students. A life-size Green turtle statue named Si Bokko Kalasahan Ku', which in Bajau means "My Lovely Turtle" was the main attraction of the exhibition. More than 100 pledges were written on it as visitors to the exhibition penned down their heart's call to save these endangered marine treasures and the statue will remain a fixture at the Semporna Library. Apart from that, posters of turtles were displayed in the hall to educate visitors on the importance of these endangered marine creatures to Semporna's ecosystem. WWF-Malaysia's Sulu-Sulawesi Ecoregion Programme Manager Robecca Jumin said it is important to run the sea turtle protection programme in Semporna, not only because the nesting and foraging turtle population is significant, but also sea turtles are key attractions in this area for tourist from all over the world.